Well, it’s the summertime and as the late Glenn Frey would say…..the heat is on! 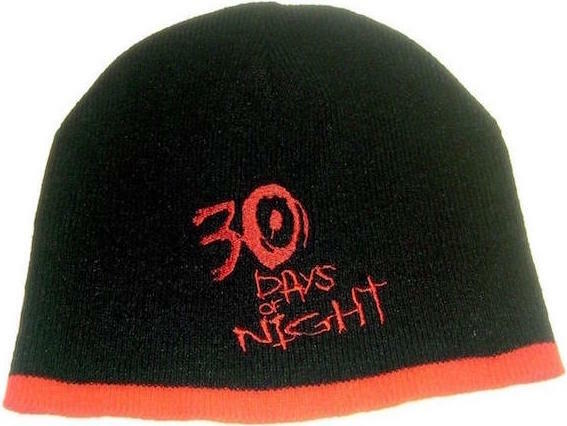 There are a lot of ways to beat the heat: a dip in the pool, rubbing ice cubes all over your body, eating some delicious ice cream, and buying a promotional 30 Days Of Night beanie. Yeah – probably not going to really keep you cool, but you will be really stylish while you’re dripping buckets of sweat from wearing a beanie in 100 degree weather. Although uneven, I actually enjoyed 2007’s vampire flick 30 Days Of Night. So much so, that I almost clicked ‘Buy It Now‘ on the eBay listing for this promotional beanie. This entry was posted in Feature and tagged 30 days of night, 30 days of night beanie, 30 days of night horror, 30 days of night promotional items, best ebay horror items, best ebay horror promotional, best horror items on ebay, dirty horror, ebay find of the week, ebay horror finds, feature by Dirty Horror. Bookmark the permalink.